The DCM Series is the top of the line in mechanical drum handling forklift attachments. Units are equipped with a double clamping system, engaging drum in two (2) spots on top chime. 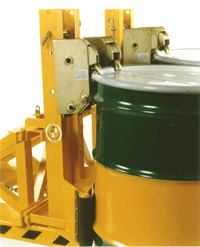 Swivel action accommodates for misaligned or separated drums. Ideal for loading or unloading trucks. Please call ZORIN (888) 378-6525 with any questions. Thanks.